Private nutrition and livestock consultant based in Roseburg, Ore.
HFG: When did you first know that you’d choose a career in forage and livestock? WL: After my undergraduate studies, I spent a couple of years in the Peace Corps in Malaysia. I wanted to help people and make a better world. When I traveled back home through New Zealand, I was stunned and very impressed. I had never seen grass-based farms like that before. I spent the next few months working on a few of those farms and traveling around the country. The way of life, the care of the land, the sustainability of grass and sunlight, the beauty and rhythm of grazing operations — these all appealed to me during a time when I was trying to make decisions about my future direction. HFG: During your time in the Peace Corps, did you take anything from that experience that continues to help with your current work? WL: Yes — that our way of doing things is not the only way of doing things. That before we can give good advice to anyone, we first need to walk in the other person’s shoes. HFG: Sheep have always been your specialty. What are a couple things that make grazing sheep different than grazing cattle? WL: Actually, I work with sheep and cattle and other ruminants and also horses and camelids. Yes, there are species differences in preferences for forage species, grazing height, weeds, tendency to browse, and so forth. But with sheep, cattle, and goats, these become minimal when the stocking density moves to high levels, as it should. One difference, however, is that cattle are always in production, whereas sheep are not. Cows are always pregnant, milking, or both. Ewes have at least 15 weeks of low maintenance requirements every year. If we recognize the differences in nutritional requirements, we can take advantage of these in our grazing strategies and in managing the forages. HFG: As a long-time proponent and facilitator of local grazing groups, what are a few key components that make these groups successful? Failures? WL: Simple: a good facilitator. This is a universal principle. Without a good facilitator, a producer group struggles to survive and provide ongoing value for its members. The three groups here in western Oregon that I facilitate have all been very active and beneficial for their members for more than 15 years. Some of the original members of each group are still active members. A good producer group becomes an important part of each member’s management strategy. Failures? Well, producer groups that depend on grants and public taxes for support are behind the eight ball from the start. That includes public employees on tax-dollar salaries. In contrast, private groups where members pay real dues can survive and thrive regardless of the whims of government budgets and granting agencies. We have done that here in Oregon quite successfully and sustainably. HFG: What is the biggest mistake that you see livestock graziers make, even after years of grazing livestock? WL: I can’t answer that simply. We have to recognize that every operation is a complex web of factors, that each operation has its own profile of goals, values, constraints, skills, sense of risk, and so forth. Reasons for success and failure are ultimately integrated with all the facets of an operation. The bottom line of any grazing operation is the net profit in the bank at the end of the day. But one thing does stand out: knowledge. Knowledge is indeed power. Good knowledge helps us make better decisions. Good knowledge reduces the risk of wrecks. My goal as a consultant, teacher, and writer has been to help provide better knowledge to graziers, in conventional and nonconventional ways. HFG: If you could give a presentation on any specific livestock or nutrition topic, what would it be? Why? WL: The value of producer groups — what they do, how they function, how they help, and how to create and facilitate them. The traditional top-down model of workshops, courses, and field days does not work nearly as well as people working together on an ongoing basis. In producer groups, farmers and ranchers can share information and get feedback from knowledgeable fellow graziers to evaluate and reinforce new ideas and techniques. HFG: What is a main limiting factor in the grazing world? 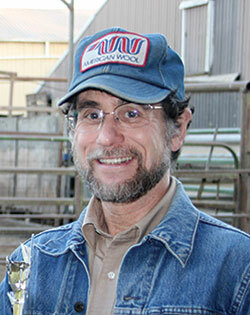 WL: We don’t have good information about how different forage cultivars react to grazing. Our formal variety trials are based on hay management, not grazing. With making hay, we have low residuals and relatively long rest periods. Grazing treats forages quite differently, with much more variation. Graziers need good comparative information on factors such as cultivar characteristics (for example, regrowth rate), response to trampling, effective tillering, and the ability to maintain ground cover over time under specific conditions. Currently, we have no good arrangements in the U.S. for generating this information. HFG: Do you see any major breakthroughs in the future of grazing? WL: Yes, CRISPR. This is a revolutionary gene-editing technique. Genetic changes will never be the same. HFG: What are your thoughts on the relatively recent mob grazing movement? WL: We need more science about it. Lots of things happen in a pasture with stocking densities greater than 200,000 pounds per acre and long rest periods — things like plant response, nutritional value, dry matter intake, sorting, trampling, soil compaction, soil microecology, and so forth. Good scientific studies on mob grazing may be difficult to conduct; nonetheless, we need good science here. We should not underestimate or diminish the power of well-designed and properly executed and analyzed scientific trials. Otherwise, the information used by producers is based on collections of testimonials and YouTube videos. Anyone wanting to try this mob grazing strategy assumes a lot of risk. HFG: You’ve had experiences both in the eastern and western United States. How is grazing in the Pacific Northwest different from the Northeast or Midwest? WL: I live in the rainy part of the Pacific Northwest (PNW) on the west side of the Cascade Mountains. This mild PNW climate is very different than the rest of the country. We grow grass here, in some ways as well as any place in the world. With irrigation, we can grow high-quality forage 365 days a year. Our growing season begins in late September or October. The ground does not freeze in the winter. Summers are bone dry. Summer days routinely have humidity less than 20 percent. And the trees here tend to get rather large. HFG: What excites you the most about the future of the livestock industry? WL: We capture sunlight in grass and convert it to wholesome animal products. We can do this on nearly any type of landscape, from high-producing farming country to lands that should not be used for anything else, and we can do it in a sustainable and ethical way. Raising livestock on grass is one of the best ways of growing food in the world. This article appeared in the April/May 2017 issue of Hay & Forage Grower on page 12.